We are excited to be hosting a 50 year reunion of the Olympic Marathon Trials that were held right here at Adams State University! You won’t want to miss it! Below is some information on the event and well as a schedule! Hope to see you all then! Media Contacts: Shaun Wicen, Adams State Athletics, swicen@adams.edu; or Chris Lopez, Adams State Public Relations, chrislopez@adams.edu. • WHAT: 50-Year Reunion of 1968 Olympic Marathon Trials held August 18, 1968, in Alamosa, Colorado. • WHERE: Adams State University and Alamosa, Colorado. ALAMOSA, CO. (February 8) – The names that put distance running and high-altitude training on the map will return to Alamosa and Adams State University this summer to mark 50 years since the U.S. Olympic Marathon Trials were held Aug. 18, 1968, in this high-altitude city. An 8K run for all comers is scheduled for Saturday, July 28. Frank Shorter, Billy Mills, Amby Burfoot, Bill Clark, Hal Higdon and other U.S. distance running greats will join U.S. Hall of Fame running coach Joe I. Vigil for a 50-year reunion to reflect on what became the start of a running boom in the United States and an emphasis on the benefits of training at high altitude such as Alamosa’s 7,544-foot elevation. 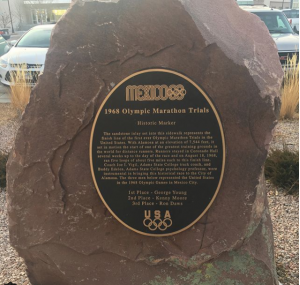 The fact that Alamosa had a similar altitude as 1968 Olympic Games host Mexico City brought the nation’s best marathon runners here to train, and convinced the AAU Long Distance Running Committee to hold the U.S. Olympic marathon trials in Alamosa. With Vigil and co-director Buddy Edelen organizing the training and marathon events, the seeds also were planted for the development of one of America’s most successful collegiate distance running programs. 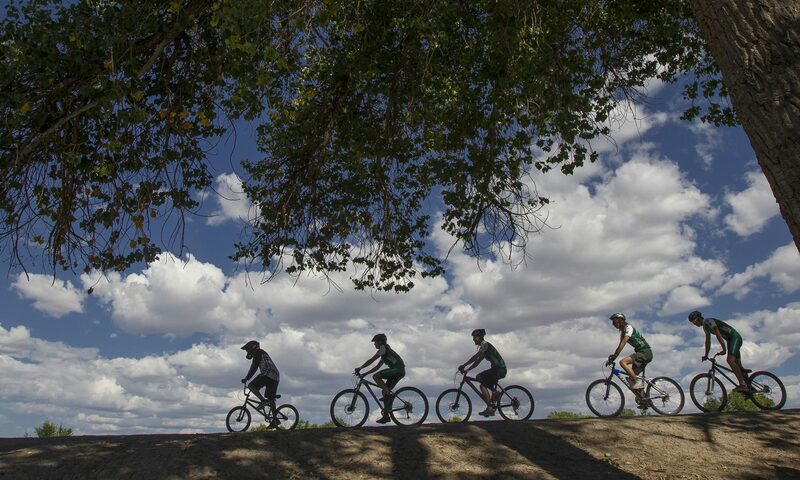 With 54 running national championships – men and women combined – Adams State is unequaled by any school in any sport in any collegiate division. On Saturday morning, July 28, the runners will participate in an 8K run that largely follows the same marathon course Alamosa set up for the 1968 U.S. Olympic Marathon trials. 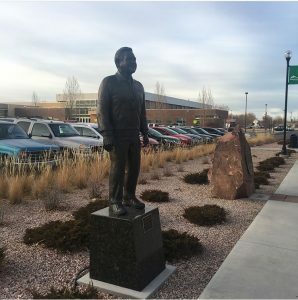 That evening, a banquet will be held at Adams State to honor the running legends and recognize Alamosa and Adams State’s role in making popular high-altitude training. Six-time Pikes Peak marathon champion Steve Gauchpin, also known as the “King of the Mountain,” is expected to participate in the 1968 reunion. So are Burfoot and Clark, who finished first and second, respectively, in the 1968 Boston Marathon. Masters running legend Jan Frisbe is expected to attend the Alamosa reunion, as is Dave Costill, one of the pioneers of research on runners and director of the Human Performance Laboratory at Ball State University. Other legends coming in for the event include Deana Kastor, who trained under Vigil in Alamosa and earned a bronze medal in the marathon during the 2004 Athens Olympics; Steve Basley, co-founder of the popular Bolder Boulder; and Steve Jones, who ran 2:08:05 to break the world marathon record at the 1984 Chicago Marathon. Shorter, who won gold in the 1972 Olympic Games marathon, will be among the running stars returning to Alamosa. Another will be the legendary Mills, the Lakota Sioux runner who became the first American to win the gold medal in the 10,000-meter run at the 1964 Tokyo Olympic Games. It literally will be a who’s-who of the running world descending on Alamosa for the 50-year reunion of the Alamosa Marathon. Registration for the July 28 8K run is available by emailing alumni@adams.edu or visit www.asugrizzlies.com. What: A reunion for ASC/ASU cross country and track & field alumni! Adams State has had unprecedented success during its storied history and we would like to get everyone back together again. This could be your last opportunity to see and visit with our great alumni, coaches and support staff. Please make the time to attend! Adams State will be hosting an 8K race (largely the same course as the 1968 Olympic Marathon Trials) to commemorate the 50th anniversary. In the summer of 1968, Adams State and Alamosa served as host to the very first Olympic trials for the United States in the marathon. We have received commitments from many of the ’68 marathon participants to attend this event, including George Young, Kenny Moore, Billy Mills, Frank Shorter, Steve Gauchipin, Amby Burfoot, along with many more. 6:00 pm 50-Year Olympic Marathon Celebration Banquet (location TBA). For more information, please contact Coach Damon Martin at 719-587-7266 or ddmartin@adams.edu. To make reservations, please call Gaylene Horning at 719-587-8110 or alumni@adams.edu. We encourage you to make your hotel reservations at one of our Grizzly Club Corporate Sponsor hotels: Super 8 (719-589-6447), Best Western—Alamosa Inn (719-589-2567), Comfort Inn (719-587-9000), Holiday Inn Express (719-589-4026) or Hampton Inn (719-480-6023). This weekend is busy as it is also Ski-Hi Stampede, so reservations should be made without delay. The following hotels have placed limited blocks until May 1st: Hampton Inn (719-480-6023), Fairfield (719-587-4000), and Comfort Inn (719-587-9000). Holiday Inn Express is offering a special rate of $169. You must refer to the 50-Year Olympic Marathon Celebration to get the block/special rates. We also have some dorm rooms on campus that will be available on a limited, first-come, first-served basis. The cost of these room is: $60/night for a suite that sleeps 4 or $30/night for a half-suite that sleeps 2. To make these reservations you need to contact Berna Hoffstetter at bmhostetter@adams.edu.